Paula Jorde Bloom serves as the Michael W. Louis Endowed Chair of the McCormick Center for Early Childhood Leadership and as a professor in the Department of Early Childhood Education at National Louis University. She received her master's and doctorate degrees from Stanford University. Dr. Bloom has taught preschool and kindergarten, designed and directed a child care center, and served as administrator of a campus laboratory school. She is a frequent keynote speaker at state, national, and international early childhood conferences and serves as consultant to professional organizations and state agencies. Paula is the author of numerous journal articles and several books. 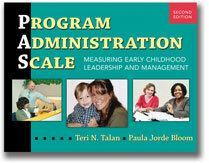 Measure and improve the leadership and management practices in your center-based program. This scale assesses 25 items—from center operations to family partnerships. 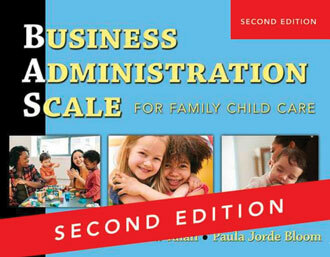 This second edition includes refinements to support the reliable use of the scale and reflects current best practices in early childhood administration. 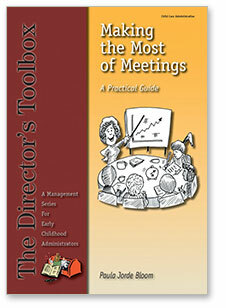 Meetings are the glue that holds early childhood organizations together. Whether it’s a weekly staff meeting, a monthly parent meeting, or an annual board meeting, directors rely on meetings as the primary vehicle for communicating information, identifying and solving problems, and making new decisions and modifying old ones. This book is filled with practical tips and techniques to help you increase meeting effectiveness. You’ll learn how to accomplish more work in less time and have more fun in the process.